My in-laws live about 45 minutes outside Philadelphia and often come into the city to meet up with us and try new restaurants. However, we thought we’d give them a break from 76 and come closer to them last time we met up. After conferencing with my friend, Dorrie, we decided to meet at Forest and Main Brewing Company in Ambler, PA. Dorrie said they had a great beer list and we were looking forward to checking it out. In fact, unbeknownst to us, Forest and Main won Philly Mag’s coveted “Best of Philly” award in the brew pub catergory. Forest and Main is just off the Main Street in “downtown” Ambler in an adorable old Victorian house. It was a gorgeous evening and we were able to dine at one of the few tables on the front porch, giving it an incredible homey feeling. Our visit happened to be during Ambler Restaurant Week. I’m not usually a big fan of restaurant weeks, due to overcrowding, sub-par food and service and the fact that you’re not always getting a deal (paying $35 for 3 courses when you would normally only order two for $25, for example.) Forest and Main’s Restaurant Week menu had two things going for it: you could choose any three dishes, none of which had to be a dessert AND the price tag of $25 included a beer. What a great deal! 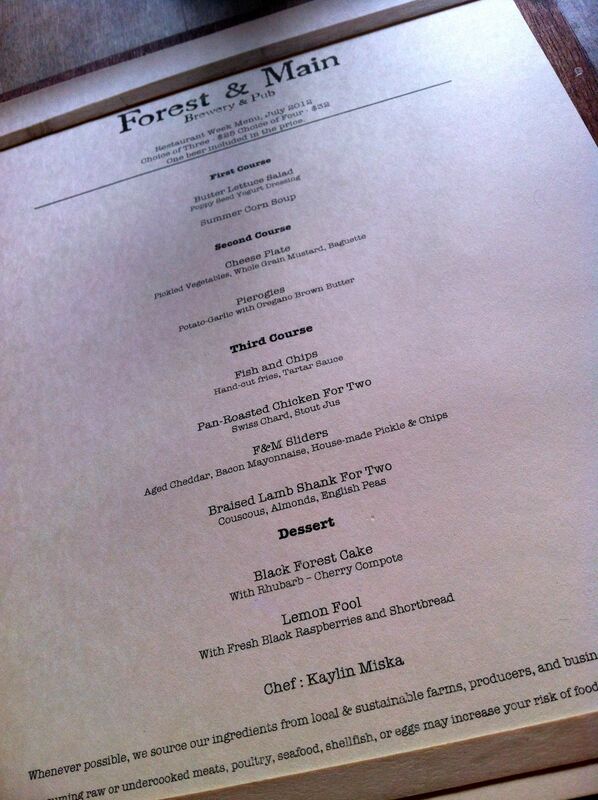 My husband and I both opted for the Restaurant Week menu while his parents chose to order a la carte. Before the food order, we had a more important decision to make–beer. Forest and Main’s beer list is split into two sections: of British Inspiration and of Belgian Inspiration and you can get 16 or 20 oz. pours ranging from a reasonable $4.50-$7. 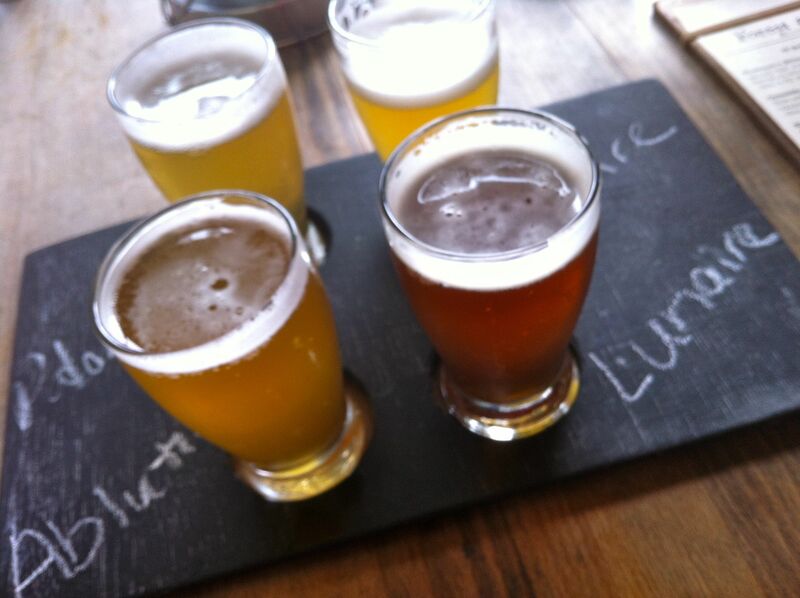 For the indecisive, or those who like to taste a little bit of everything, flights of four are also available. I am of the “like to taste a little bit of everything” mindset and got the flight of all four “of Belgian Inspiration” beers. Of the four, my favorite was the tripel-style Ablution. Big and fruity, it was a favorite to everyone at the table, even my non-beer drinking mother-in-law. For my three food choices, I selected summer corn soup, pierogies and the F&M sliders. 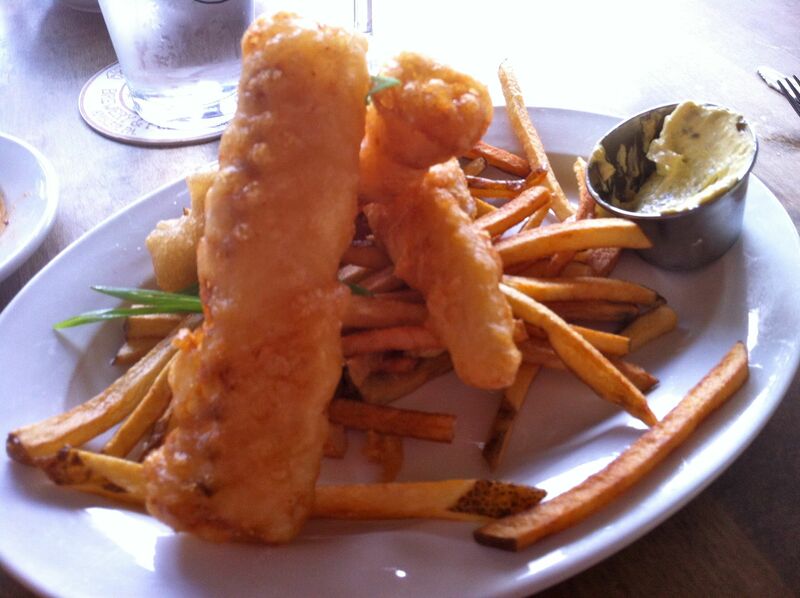 My husband chose the same, but swapped the sliders for the fish and chips. We had a discussion at the table about whether we wanted to order bacon popcorn. My father-in-law was mysteriously quiet until we asked his opinion. “You can get what you want, but I’m getting one for myself,” said the bacon lover. The popcorn came out with the soup. It was adorable in the tin, Ikea buckets. 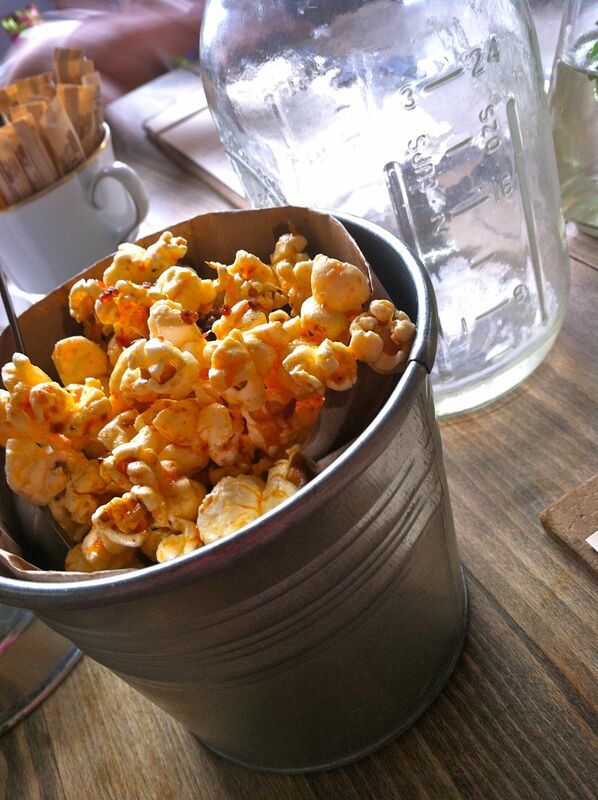 The popcorn received mixed reviews at the table. The in-laws loved it, but I found it to be a bit greasy for my taste. There was a definite smoky flavor from the bacon, so be forewarned if you’re not a fan of smoke! The corn soup was a hit. 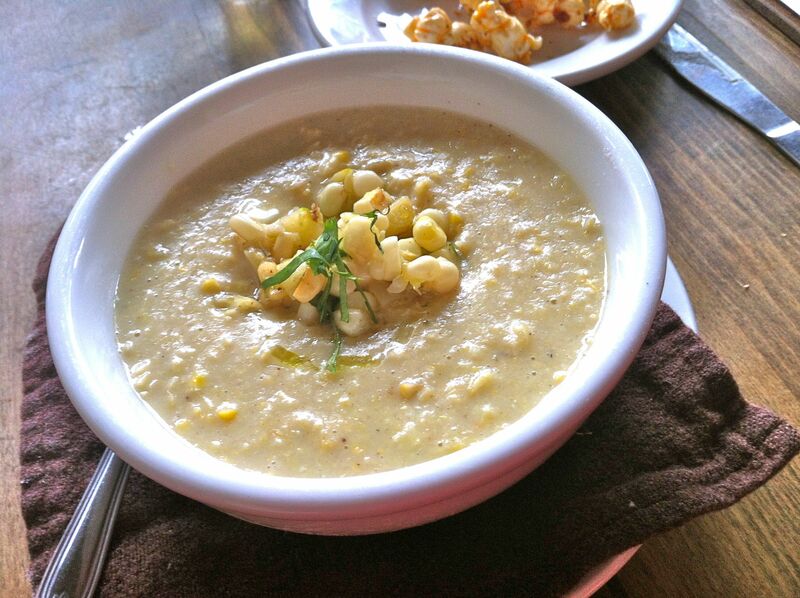 It was thick and chunky with just the right kick of jalapeno and creamy sweet corn. Besides, it’s the height of corn season. It would be hard for this dish not to taste good. I did sneak a few pieces of the popcorn into the soup which is highly recommended! This was probably my favorite dish of the night. Next was a generous serving of pierogies. They looked beautiful. 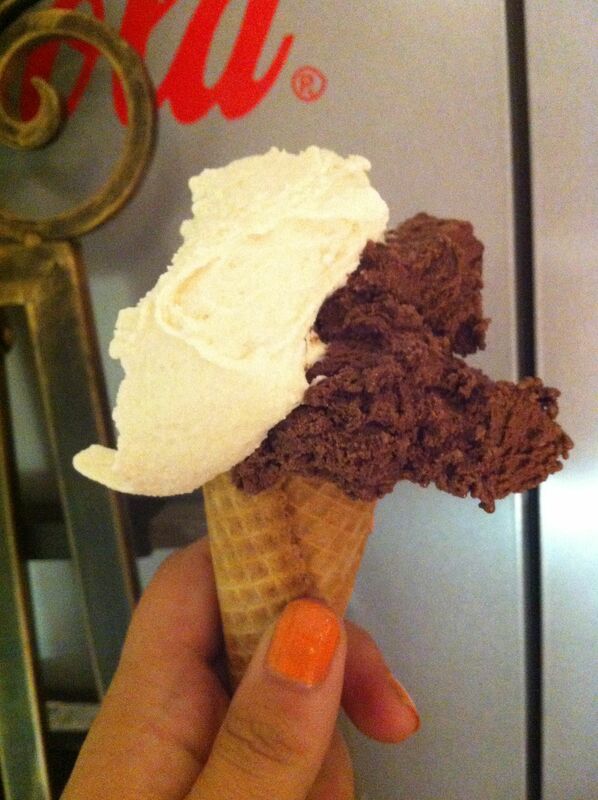 I was surprised to receive such a large serving and ended up taking two home. 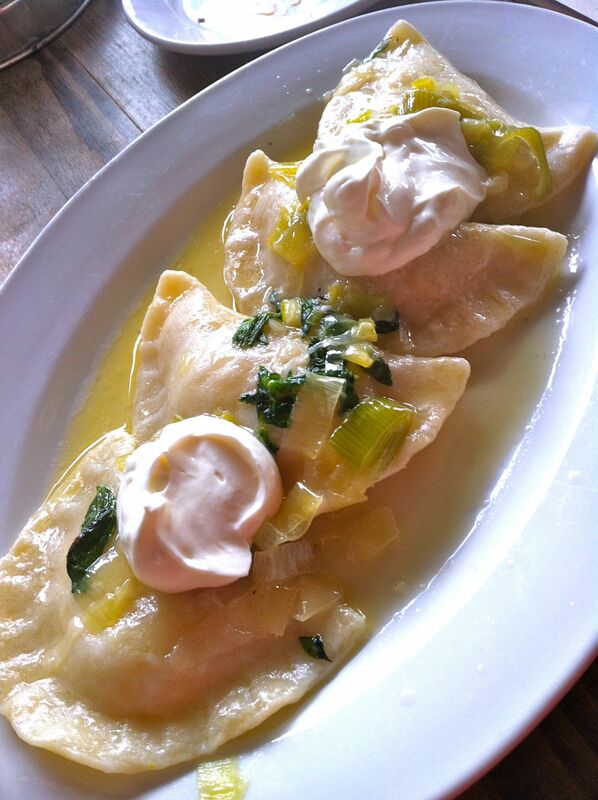 These pierogies had potential to be good–I loved the sauteed leeks on top–but they were absolutely swimming in butter. And I do love butter. I was looking forward to the sliders. Sliders are so cute. 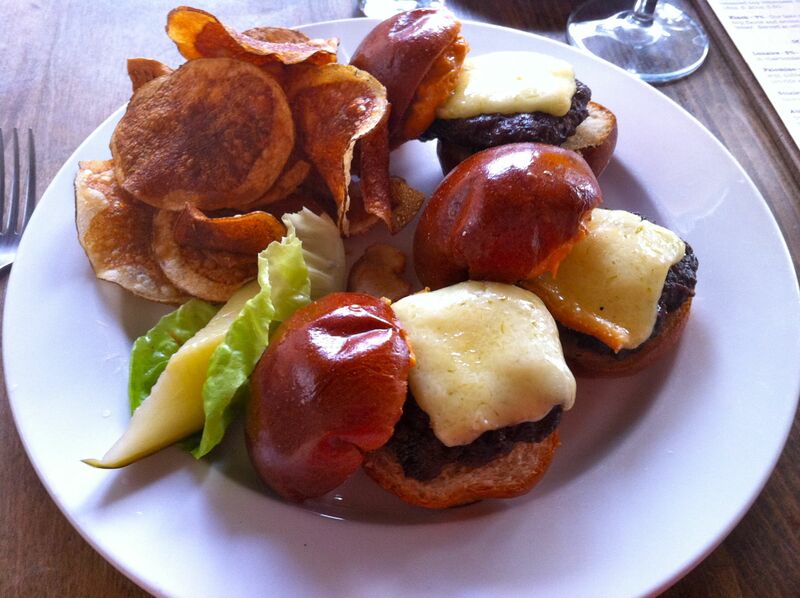 And they came with aged cheddar and bacon mayonnaise. Sold! The sliders turned out to be a bit overdone with a bread to meat ratio that leaned heavily on the side of bread. Perhaps the full-sized version would be better. The house made chips were a great side, though. The fish and chips were decent and came with a bottle of malt vinegar for that extra sour tang and a solid side of fries. 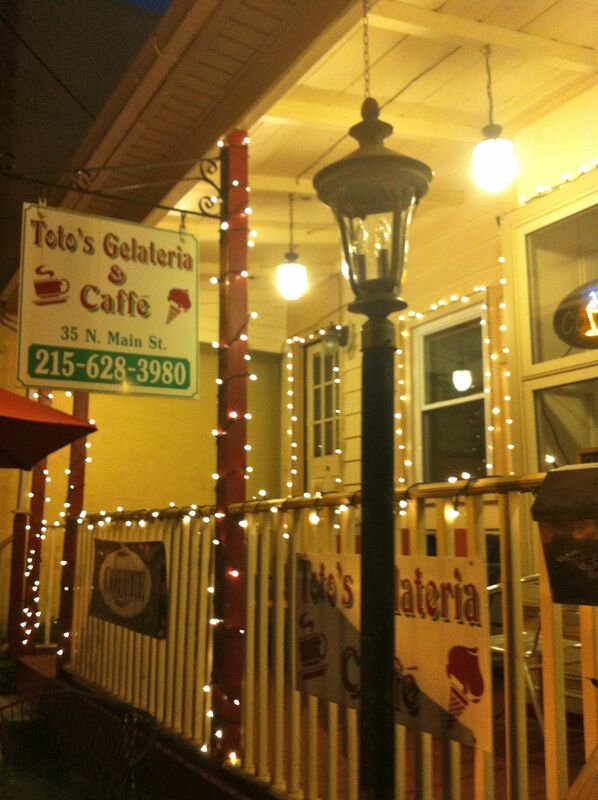 We decided to forgo dessert and took a stroll around “downtown” Ambler. 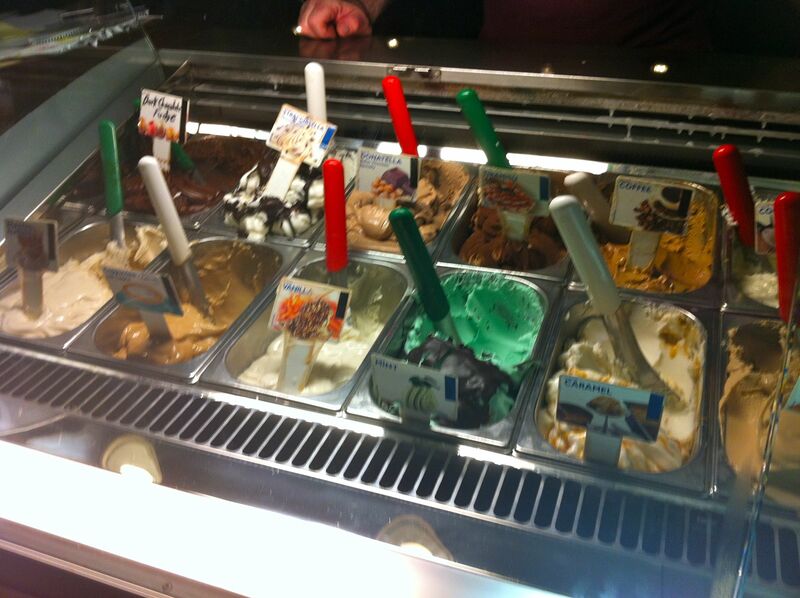 Before heading back, we stopped at Toto’s Gelateria and Caffe for some gelato made in house. What a perfect combo. After chatting with the friendly owner, we sat at an outdoor table and enjoyed our dessert. Overall, Ambler is a cute little town. While I wouldn’t go out of my way to hit Forest and Main, I think it would be a great stop for a beer and some apps. I’ll give them the benefit of the doubt since I did go during restaurant week, but I’d like to see some more consistency in the food because this place really has potential.